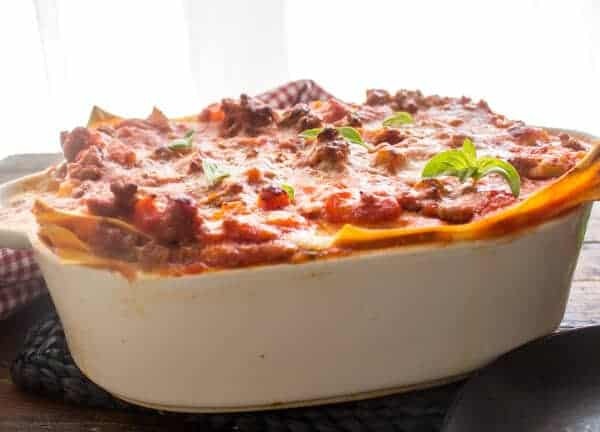 Red Sauce Italian Classic Lasagna, a delicious baked Pasta Recipe. Homemade sauce makes this Lasagna one of the best. The perfect family Dinner. 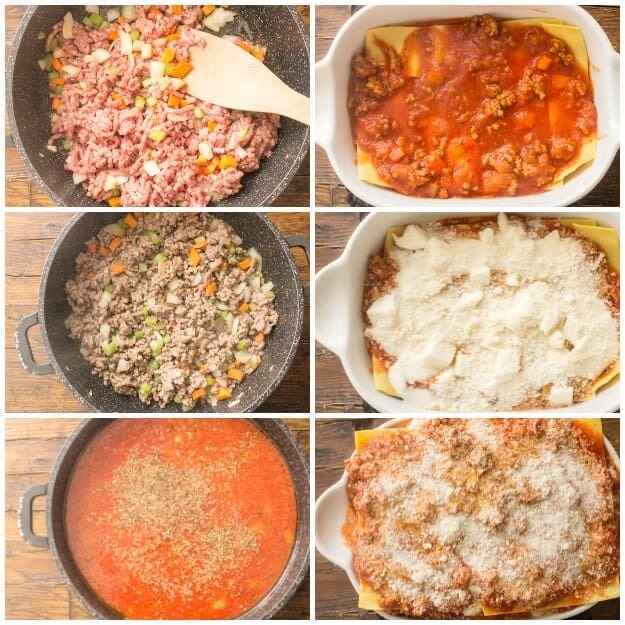 Classic Lasagna, so many different type and they’re all so good! There are so many delicious ways of making lasagna. I have to admit I have eaten more types of lasagna than I can count on one hand. There’s the veggie lasagna, white lasagna, asparagus lasagna and the Classic Lasagna just to name a few which make amazing RECIPES FOR LASAGNA. 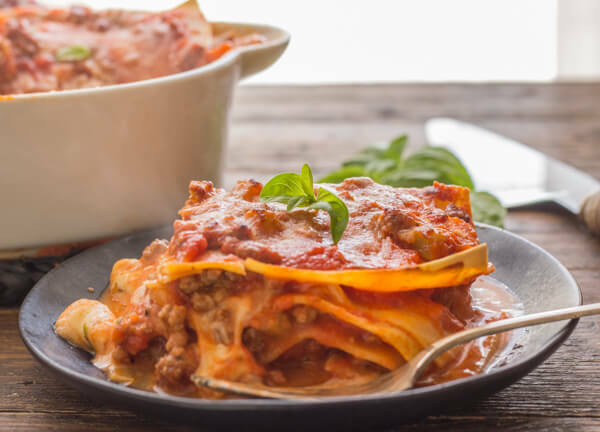 The traditional or Classic Lasagna is made by layering flat noodles with a meat sauce then with a bechamel sauce and Parmigiano-Reggiano cheese as added ingredients. The classic dish that I ate here in Italy which is common in the Region where I live (Lazio) is made with a meat sauce, mozzarella, parmesan cheese and a creamy white sauce. I know some of you will ask “what no ricotta or hard-boiled eggs?” I’m afraid you will have to go a little more to the south of Italy to find this type of lasagna. I know some of you will ask “what no ricotta or hard-boiled eggs?” I’m afraid you will have to go a little more to the south of Italy to find this type of lasagna. But trust me you will not be disappointed in this Classic Lasagna from Lazio. 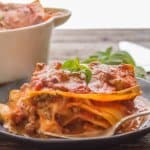 I made four delicious layers, I used oven ready lasagna noodles, but you can also use fresh lasagna noodles, whatever you prefer is perfect. 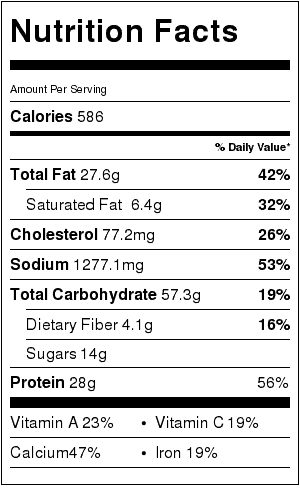 I usually start my sauce a few hours before I put the lasagna together, because I like the ingredients to mingle. I love this dish because it really is one of the easiest dishes to put together. Imagine four layers of noodles, a wonderfully thick meat sauce, chopped fresh mozzarella , lots of freshly grated mozzarella and that creamy white sauce. Need I say more? Buon Appetito! No one knows Lasagna better than an Italian, the perfect Classic Lasagna, creamy and delicious. a delicious family baked pasta recipe. In a large pot add oil, ground beef, chopped carrots, celery, onion, garlic and salt, sauté for approximately 10 minutes or until meat has started to brown, then add the tomato pure, water and spices, cook on medium heat until thickened (quite thick). For the white sauce, in a medium pot over medium heat melt butter, then add flour and salt, combine with a whisk, add milk slowly and continue to stir until thickened (taste for salt). Remove from heat. (or you can purchase a good store bought white sauce). 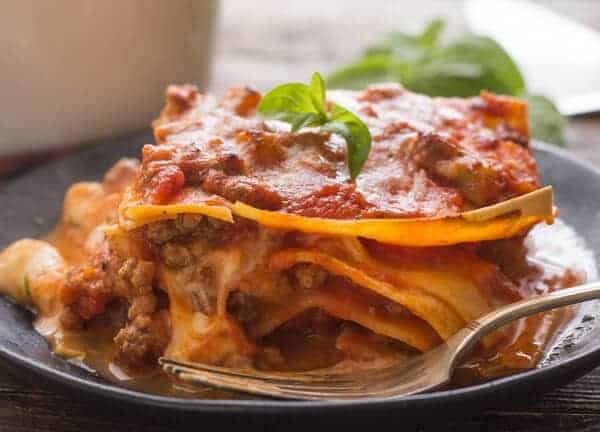 In a baking dish measuring 10x10x2 (25x25x5 centimeters) add 1- 1 1/2 ladles of meat sauce, do 3-4 layers (I did 4) starting with lasagna noodles, then meat sauce, white sauce, chopped mozzarella and parmesan cheese, continue with the layers, the last layer should be without the white sauce, remember to divide ingredients by 3 or 4. Bake in a pre-heated oven for approximate 20-25 minutes. Let sit 5-10 minutes before serving. Enjoy! Hello. I’m eager to give your recipe a try; it looks delicious. What brand of tomato purée do you prefer? Thank you. Hi Ruby, thanks I hope you like it. Here in Italy there are so many but I usually use a few different ones, a couple that I use are called Star or Cirio. In Canada I used one called Aurora or one called Pastene (on the bottle it says strained crushed tomatoes, or just strained tomatoes, nothing else added and not to be confused with tomato paste, it is usually a 3/5 liter (about 3 cups) bottle) hope this helps. This looks phenomenal! I went to school for a bit in Firenze and travelled all around the Lazio region while I was there – absolutely gorgeous and oh how I miss it! 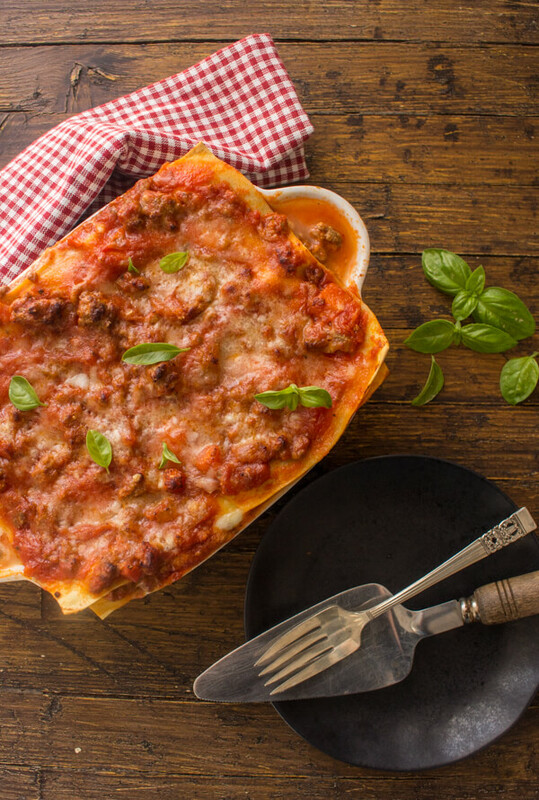 Lasagna is one of my favorite comfort foods – and I love your classic recipe! I’ll definitely make this next time I make lasagna – Pinning! I love lasagna also, it is one food that I never tire of. I must admit this is a beautiful region. Hope you enjoy this classic Lasagna.